WHAT IS IT? My inspiration for this nail art were the grey gentlemen from Michael Ende’s Momo, a quite disturbing children’s book. That left quite an imprint on me as a child. The book is very well known in Germany even though most people will only know that Momo is a girl and there are grey gentlemen, trying to catch her and that it has something to do with time. I tried to use different greys to create a suttle effect with different textures. WHAT IS USED? I now remember why I hardly ever use Catrice, 900 Steel my Heart, a semi matte metallic nailpolish in dark taupe. It has a great texture but it just doesn’t dry properly. Even hours after applying the second layer it isn’t complete dry. You can’t use a quick drying topcoat because this takes away the matte effect and the Quick Dry Spray doesn’t seem to have an effect. Yet it looks cool mixed with creamy smokin hot from essie. I wanted to tape a V on the nails to symbolise a suit’s neck line but it didn’t work. The tape took away half of the Catrice polish on my nails so I decided to go free hand and only made diagonal nails. HOW DOES IT FEEL? It looks great. I like the effect of the two textures. But waiting fo it to dry is a pain. 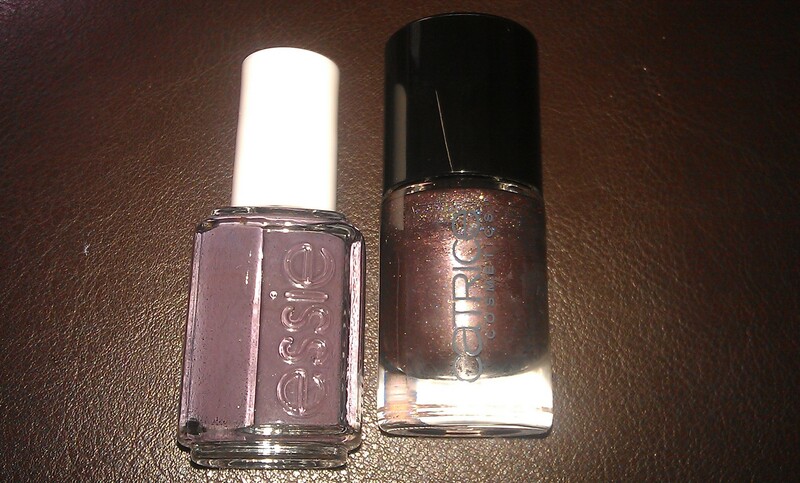 I now realise how much I like the Quick Dry Spray and the Good to Go topcoat that dry up nail polish quickly. I should have done the nails the other way round though: first the creamy polish, then the textured one as of course the texture gets through the creamy polish on top and I would have needed probably only one layer of the textured polish to create the effect and though have a shorter drying time. This entry was posted in Nail Art and tagged 31 day nail challenge, Catrice, essie, Nailpolish, smokin hot, steel my heart, Tape Mani by kathatravelling. Bookmark the permalink.